Khung Thoung Sinh, 3, is held by a nurse at Peace village inside the Tu Du hospital in Ho Chi Minh City, Vietnam on May 2, 2005. 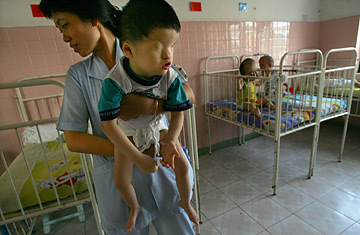 He was born without eyes having been deformed since birth from what may be the effects of defoliant Agent Orange. Clean up after yourself. It's a rule that we learn early in life. Now, more than 30 years after the U.S. pulled out of Vietnam, the time has come to follow that rule. In Vietnam these days, unlike many other places, both the people and their leaders are generally friendly toward the U.S. Vietnam has just joined the World Trade Organization, and America is both its largest export market and source of foreign investment. Intel is building a $1 billion chipmaking plant near Ho Chi Minh City.